Hello! Calling all traveling 2019 Diva Feeva Participants! If you are needing lodging guidance or help, here’s the scoop! Because the event is the week before graduation at the University Of Kansas Medical Center, which is minutes from the course and also happens to be in a pretty neat, busy, area of the twin Kansas Citys, we suggest making accommodations now. The Holiday Inn and Suites-KU Medical Center is holding a small block of rooms through April 10, 2019. Please call 913-236-8700. 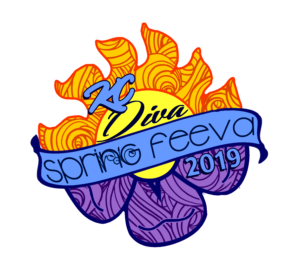 Use code “DGD” or ask for the “KC Disc Golf Diva Spring Feeva” rooms. Guaranteed at $158 so check the web as well. The hotel is located less than five minutes from Rosedale Park Disc Golf Course, home of the event and minutes to entertainment and multiple restaurants. We have lovingly searched AirBNB for accommodations that are close to the course and/or centrally located to the Kansas City area. There are lodgings available for single people for as low as $20 and houses/larger group accommodations for as low as $40 from our research. We suggest the following search terms on AirBNB’s website or app: KUMC, University of Kansas Medical Center, Prairie Village, KS, Roeland Park, KS, Rosedale, KS, Westport, MO, Country Club Plaza. Merriam, KS. Mission Hills, KS. Waldo, MO, Hyde Park. There is limited free lodging offered by Diva Feeva hosts/host families. This will be first come/first serve and we will do our best to match you with a host by 4/10/19. Should you need a host in order to make this event feasible, please e-mail crispianpaul@hotmail.com with your name, phone #, whether or not you accept text messages, how many beds/couches you need, for what days (just Friday night? Friday and Saturday? Just Saturday? ), any pet allergies, aversions to smoking or alcohol, or other special needs. Also, please know that you will be responsible for your own food and accommodations when your host is not home (i.e. during day time hours Friday etc).